When I got up this morning, I walked to the boys' bedrooms to wake them up for school. I opened the blinds in their bedrooms, and was a little taken aback at what I saw. 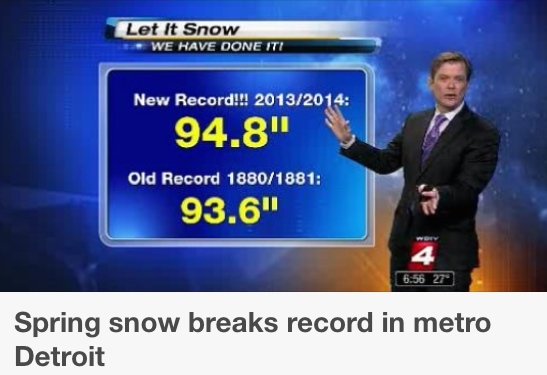 Turns out that with this snow we just got last night, Detroit broke the old record for the most snowfall in a season. The previous record was 1880-81, with 93.6". Today's put us at 94.8". So while I wasn't happy to see the snow, it IS pretty cool to have seen the snowiest winter ever. I think it's funny how the screenshot of the news above says, "We have done it!" like it's a big accomplishment that we had something to do with. Let's just hope it starts to feel like spring soon. After I got the kids off to school (in their hats and gloves and winter coats), I ate breakfast and tried to catch up on email. I got really far behind on everything while I was in California. I was actually looking forward to today's run--which is unusual for a Tuesday! Tuesday is speed work. Today, I started the portion of the Hansons' plan where the speed work switches to strength runs. They are still intervals, but they're longer in distance (1-3 miles) and they're done at a slower pace (half-marathon pace minus 10 seconds per mile). I chose to do it on the treadmill (it's much easier to maintain pace for speed work). I didn't do a warm-up, because this was already going to be a 7.5 mile run without warm-up or cool down. I set the treadmill at 6.8 mph (8:49 pace) for the 1-mile intervals, and then switched to 5.5 mph (10:54 pace) for the recovery jogs. 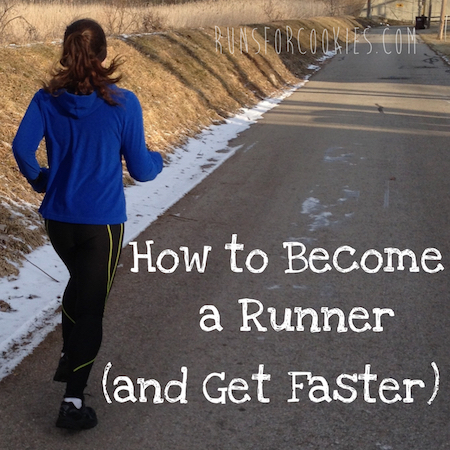 I really prefer the longer and slower intervals of this strength run to the short and fast ones for speed work! Today's run wasn't bad at all, and I felt really good during the whole thing. Maybe I should be doing a faster pace, but I'm not going to worry about that right now. I think that after the Heartbreak Hill Hat Trick, I'll go easy for a few weeks and then do my best to train for a 1:50 half-marathon (the Detroit Free Press Half this fall, or, if not that one, the Monroe Half). It's only been a couple of days, but it feels SO GOOD to get back to the norm with my diet and running routine. I'm counting points, which feels so hard after NOT counting for a few weeks, but I'm determined to lose this weight I've gained. And after a whacky run schedule due to being sick and then being in California, I'm back to the Hansons' HM schedule. Now that I've adjusted the paces to be a little slower, I don't think I'll dread the runs so much. For a while, I was just feeling totally burned out, but now I'm feeling excited to be back to the norm. Next month, I was supposed to go to Boston to do Ragnar Cape Cod. My friend Caitlin was going to do the race with me, but something out of her control came up, and she can't go now. She lives in Boston, and my travel plans kind of counted on her being there, so it's just not going to work out for me to go. I'm disappointed, because I've heard that the Cape Cod Ragnar is a great one; but maybe we can work it out for next year! So the next big thing on the schedule is the Runner's World Heartbreak Hill Half & Festival in Boston the first weekend in June. 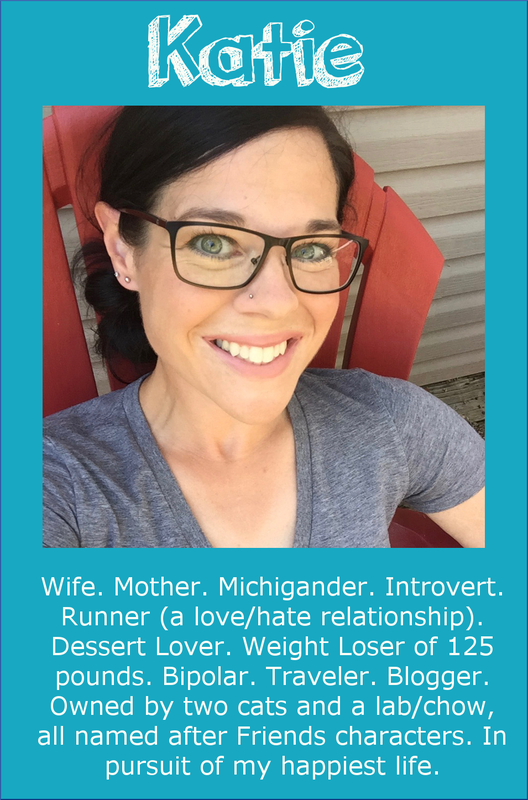 I'm actually pretty nervous about doing the Hat Trick (5K, 10K, & Half-Marathon), but I'm sure I can finish, no matter how long it takes me ;) I was kind of hoping to organize some sort of meet-up that Saturday for any of you that may be going. So if that interests you, let me know! 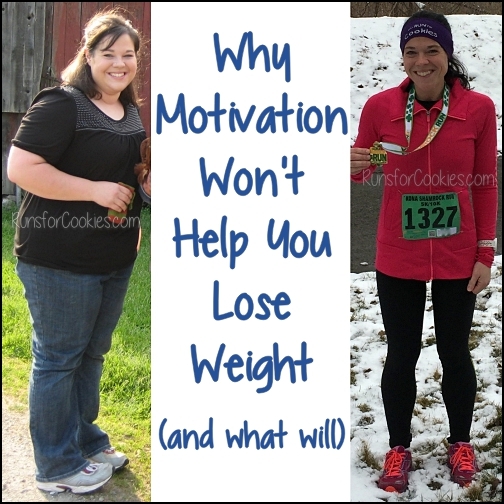 I feel like if we could shake this crazy Winter, I would be a little more motivated with my eating. I am ready for grilling! Well, I am ready for being outside in general. Oh my goodness. The snow. We were in Northern Indiana for 12 days in December/January and I literally CRIED the morning of our flight when I figured out it was snowing like crazy and we would be stuck. Actual tears. I live in Arizona and simply cannot conceive of a world with that much snow!!! Glad you're feeling back to your normal schedule! I'm rooting for you! I use eTools, but I do like to keep a written journal as well. 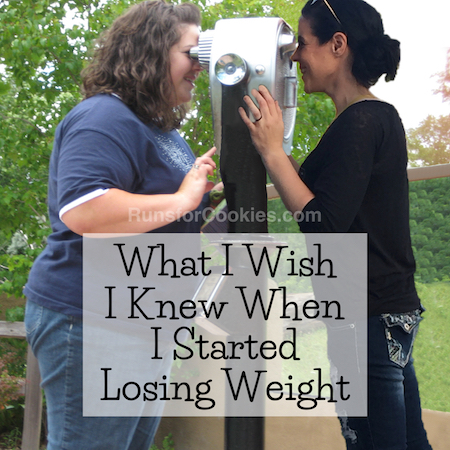 It's just easier to flip through for meal ideas or to see what I was eating during a good weight loss week. But eTools is great for on the go, because I use phone app! I know you eat your activity points and you maintain or lose. HOW??? This past week I got 71 activity points and ate pretty well ( I used some weekly points but no activity points) and as per usual I gained. The weeks I do not get a lot of activity I lose. It isn't muscle because my clothes are not getting bigger on those weeks for sure. It is so frustrating and then after weigh in I eat Chinese food. UGH. Hmmm... have you tried using your activity points? 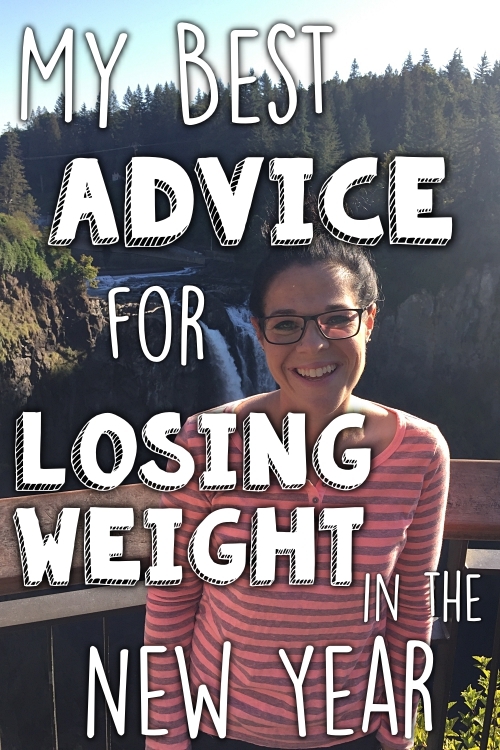 I know it seems counterproductive, but I lose the most when I eat more. I also tend to spend a huge chunk of my points on one thing, so that may have something to do with it, too. Like this week, after my long run, I might get a brownie that's 30-ish points! I would try experimenting with eating more, and just see what happens. How do you calculate your activity points? The ones for running/jogging in the eTools seem way off to me. They're much too high compared to what I think they should be. I've yet to find a way to count them that seems accurate. Everyone keeps recommending I get the Active Link, but it just seems like a lot of money to spend for something I don't really want AND that requires a monthly fee to use. I use eTools to calculate my activity points. I don't think they're too high, because I'm not eating back ALL the calories I burn. Something you could do, which I think is the most accurate, is to divide the calories burned by 80, and then round up to the nearest whole number, and that's your activity points earned. The ActiveLink will give you more AP's than the eTools will; I was earning WAY more than I thought when I was using the ActiveLink. Thanks for the help! 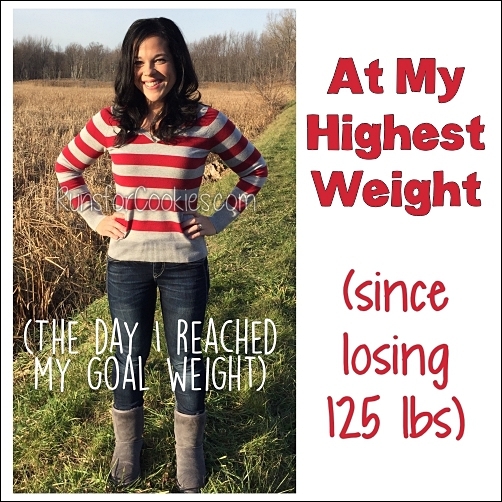 I've heard others mention the 80 calorie estimation, which is what I've been using lately. Given your feedback about the ActiveLink, I think I'll continue saving my money. 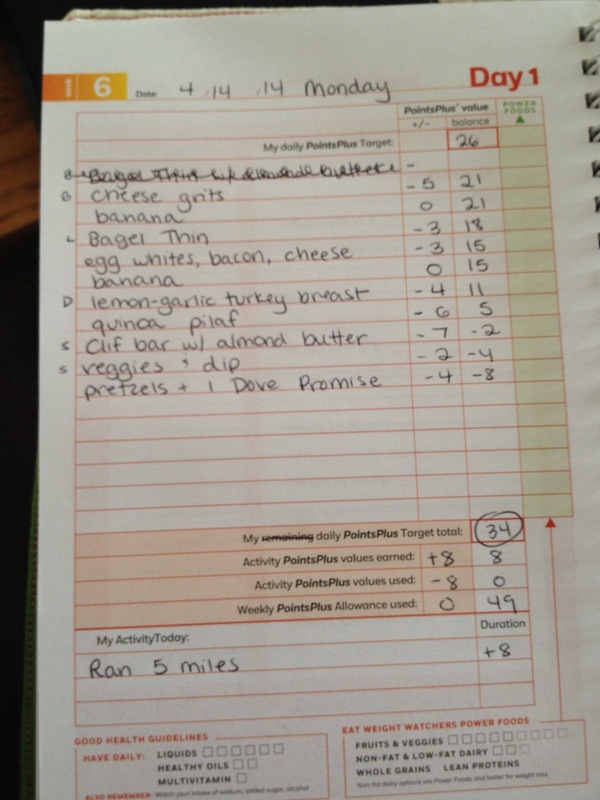 I'd much rather use the calorie burn provided by Runmeter to do an estimation. I don't eat all of my Activity Points, but I just have this brain cramp when it comes to wanting things to all track equally and accurately. Activity has been the one area where I have a difficult time getting it all in order. I trained last year for the Monroe half until I sprained my ankle which then resulted in a pinched nerve in my back from walking incorrectly. I'm excited that Monroe is doing the half again! My mom is a coach for Monroe Special Olympics - I love to support SO!! Katie, THANK YOU!! for posting your food log. I am getting super frustrated with WW. I workout hard, on my own and with a personal trainer, deny myself the super yummy bad foods and I routinely see "-.5". I know I'm getting toned, but working that hard for a half pound is hardly motivating. I'm trying to get back in shape after having Breast Cancer, and man I would love something to just be formulaic ;) Thanks for keeping me motivated.